Spray a skillet with nonstick cooking spray. Heat skillet over medium-high. As soon as it's hot, add the salmon to the skillet. Salt and pepper it and cook for 4-5 minutes before flipping and cooking on the other side. Cook just until the fish is cooked through, and becomes flaky. Add the edamame and corn to the skillet, then turn the skillet off. In a blender, add the sour cream, chipotle pepper, sundried tomatoes, and lime juice. Blend until pureed. Heat the Old El Paso™ Fiesta Rice in the microwave, according to package directions. Assemble tacos by layering rice, fish mixture in your favorite taco shells, top with spicy cream sauce and enjoy! Nothing says summertime like a nice plate of Fish Tacos. There's a fresh, fantastic flair that accompanies a meal when you serve it up with some seafood. This recipe takes the hearty, crowd-friendly texture and flavor of salmon and pairs it with a spicy cream sauce. It's also served up with a truly inspired kiss of edamame and white corn. If you're unfamiliar with edamame, or the totally snackable pods of young soybean plants, it's time you make friends with this healthy, buttery, totally incredible snack. Edamame is high in omega-3 fatty acids, folic acid, and Vitamin K. It's a great addition to a well-balanced diet. To add it to your daily menu, just microwave a pack of frozen pods and toss a bit of sea salt on top. The pods of edamame aren't edible, so they are typically eaten by placing the pod in your mouth, biting down on it, then pulling it through your teeth until the beans pop out. Eat those beans and toss the pod. If this all sounds like much too much work, many health food stores carry frozen edamame beans (that's what was used in this recipe). These bright green, frozen beans are a lifesaver in the kitchen. You can toss them into your favorite soups, pasta sauces, and (of course!) fish tacos. 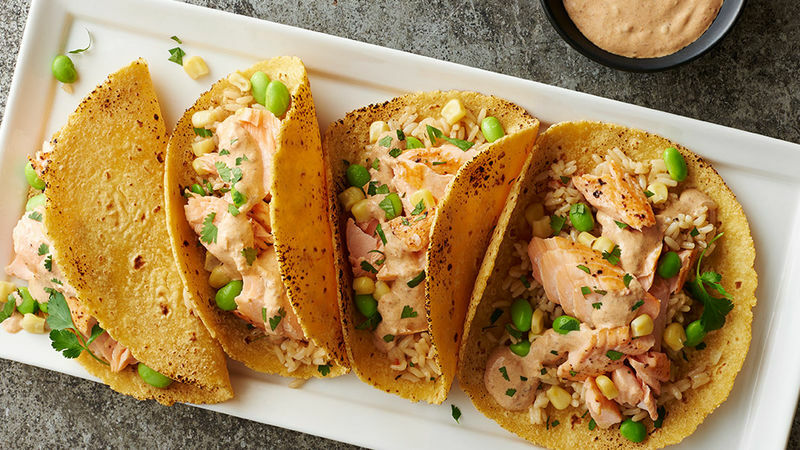 If you're looking for a unique offering for summer picnics, parties, or potlucks, you really can't go wrong with these incredibly easy, totally delicious fish tacos. Enjoy! More Fantastic Fish Recipes Fish seems perfectly suited to summer months. Here are a few more fish recipes to try this summer, or anytime!